Monday June 21st 1897 Got the morning work done and dinner ready by eleven oclock. The folks from home, Mary Woolf, and Jennie, Uncle Jim and Jeff Mc-- and Lettie were here for dinner. We went right away to Aunt Linda's funeral. Will helped me after we got home to do up the work and get our supper. he churned for me too. 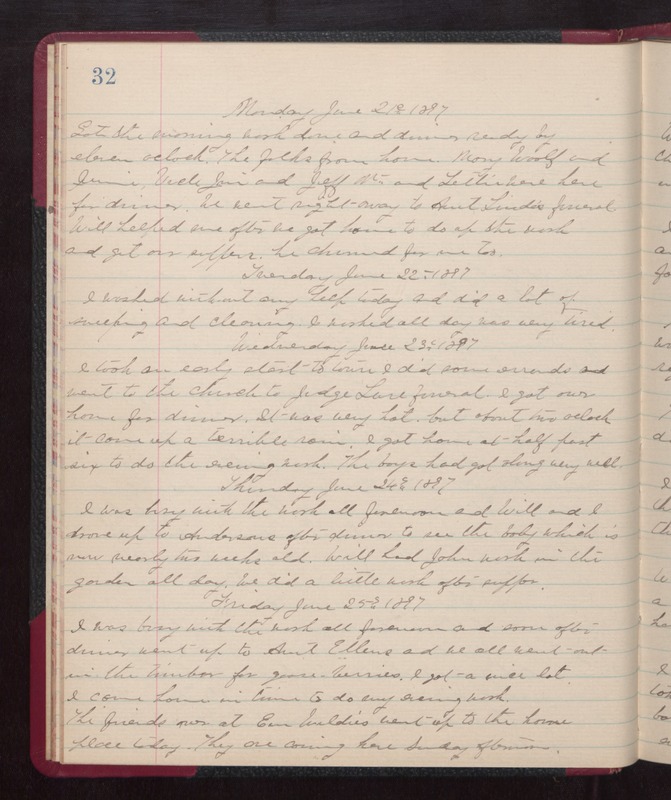 Tuesday June 22nd 1897 I washed without any help today and did a lot of sweeping and cleaning. I worked all day was very tired. Wednesday June 23rd 1897 I took an early start to town. I did some errands and went to the church to Judge Lare funeral. I got over home for dinner. It was very hot, but about two oclock it come up a terrible rain. I got home at half past six to do the evening work. The boys had got along very well. Thursday June 24th 1897 I was busy with the work all forenoon and Will and I drive up to Andersons after dinner to see the baby which is now nearly two weeks old. Will had John work in the garden all day. We did a little work after supper. Friday June 25th 1897 I was busy with the work all forenoon and soon after dinner went up to Aunt Ellens and we all went out in the timber for gooseberries. I got a nice lot. I come home in time to do my evening work. The friends over at Em Weldie's went up to the home place today. They are coming here Sunday afternoon.